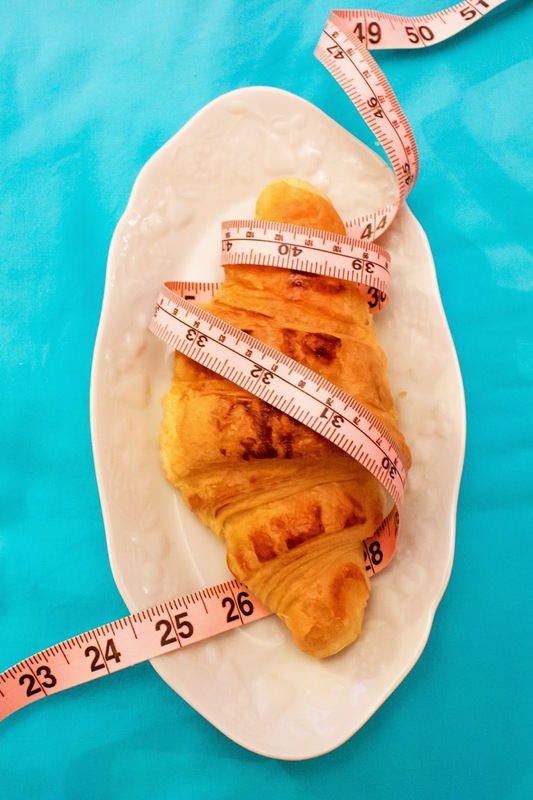 Rue en Rose: Do You Lose Weight in Paris? There is an age-old paradox which exists concerning the French, and you probably know it. When one thinks of French food, it's all buttery croissants, melt-in-your-mouth macarons, rich dark chocolate, crispy baguettes, savory cheese, and wine. Lots of wine. But when one thinks of a Frenchwoman? Thin. Fashionable. And impossibly effortless. It's just not fair. As I was packing my bags to move to Paris for a year, there was a nagging voice reminding me that my Midwestern waistline was not going to blend in with the lithe ladies of gay Paris draped seamlessly in black and cashmere. Those glorious womanly curves I was given at the ripe old age of 12 wouldn't stand for it. And you know what? That voice was right. When I moved to Paris, I didn't blend in. In fact, contrary to my every hope that somehow I would mysteriously, chemically osmososize that particular French thinness, it was the opposite. I gained back every last pound of the weight I had hard worked to lose last year through hours of sweating it out at the gym and meticulously, mercilessly calorie counting. A whole year's work gone in two months. Talk about a downer. Add to that a couple weeks of indulgent holiday feasting, and by the time it came to make New Years resolutions, well, I felt doomed. Then came the turning point. This is where you might expect me to insert my "10 Quick Steps to Weight Loss in Paris". Or "How I shed half my body weight in just 8 weeks with some miraculous French diet." But you see, that's exactly why I am writing this blog. It's not so easy as a checklist or a purging period. It wasn't about the number on the scale. The turning point was in my mind. And it began in a library. My friend Haley, a fellow au pair during my first few months in Paris, had been trying to get me to read a book that she claimed changed her life, French Women Don't Get Fat by Mireille Guiliano. She told me how it transformed her relationship with food, and I should really read it. So one bitter January afternoon while wallowing in typical abysmal post-holiday food guilt, I went out in search of something to grind salt into my wounded vanity, as most women do in such low points. I found a copy of FWDGF at the American Library in Paris and figured I'd at least give it read, as a "cultural learning experience" (and, like most women, to reenforce how many ways I was failing). But the book was a little different than I expected. To start, Mireille pointed out that there would be no easy-to-follow chart on a 14-day cleanse, or jumpstart your weight-loss infographic in the book. In order to adopt a new lifestyle, one had to take time and invest, like reading a book essay-style. That made sense, so I kept reading (and that's why I'm avoiding bullets in this post, against my every inclination). I read all of it in two days, and, feeling impressed to continue this "cultural learning experience" I decided to conduct a 30 day trial of the first phase of her book. I figured the initial changes she was asking for were minimal, and I had 8 more months in France, so what could I lose? First, I started a food journal. This was not a calorie-counting journal, mind you, like I had last year. (I will always know a large white egg cooked over-hard is 70 calories---some habits die hard!). This was an experiential food journal. What I ate, roughly how much (a palmful of this, a handful of that), and how it made me feel. The point was to draw your attention to certain eating habits you were given to, and what were your regular "offenders." But for me as well, to understand exactly how the food I was eating was directly affecting my body. After several days, I started noticing subtle signals my body had been giving me that before I had not noticed, like when I was actually satisfied or when I was eating just to fuel myself. I started noticing how I spread out the kinds of food I ate through the day and how it affected my energy. I also noticed when I had to write down chocolate three times a day. Oops. Writing down your food makes you accountable. As part of this experiential eating, I started to seek out the individual tastes that made each food unique and name them. I never noticed how earthy whole grain bread tasted. How clementines make my senses alive. How spinach has a bitter tang that I will never like. In particular, I learned to enjoy the taste of plain yogurt, because really nothing tastes like that tart, cold, creamy substance. (I now prefer plain to flavored.) But, seriously, who focuses on their food that much, Rue? Maybe we would, if we actually paid attention during meals. Eliminate distraction. I stopped doing other things while I was eating. No phone. No TV. No computer. No book. No distraction. My activity of the moment was to experience my plate. (How counter-cultural is this in America? I defy you to find someone sitting alone with just their food in front of them and no distraction. People really don't know how to just be with their food!) When you begin eat less, you really want to appreciate what you are eating. And mindlessly eating robs us of that pleasure. Did I say eat less?! I will admit, living in France has dramatically changed my perception of what "enough" means. But I didn't just slash my portions in half. I did it gradually, listening to my body and asking when I was actually still hungry and when I was just eating because it was on my plate or the table. And I realized I didn't actually want more than a few bites of each dish, because after that I had reached the peak of my ability to taste that specific taste and the rest was feeding mentality. More is not necessarily better. Which goes for frequency as well. Three meals a day, with no snacking in between. Well, perhaps an occasional yogurt or black coffee between lunch (12 or 1pm) and dinner (7 or 8pm). But again, it makes me savor and appreciate what I do eat. And more often than not, I'm not hungry, I'm actually thirsty. And if a glass of water doesn't cut it, I'm probably just bored. Which brings me to my last and perhaps most precious change. Movement. Notice I did not say workout. Movement extends beyond obvious exercise. It's incorporating movement throughout your day, forgoing the convenient and embracing the beneficial. So as my first physical embellishment to my month of change, I banished escalators and elevators from my routine. Because really, stairs are usually faster, and it's not that much work. Maybe I'm slanted after having to climb 6 flights of stairs multiple times a day to get to my studio, but really it's such small change that can add up over time. Movement starts with little adjustments like that, and doesn't have to include hours of slaving on the elliptical. To be fair, I sorely miss my free Zumba classes back in the States... But in typical American extremism, that was when I would sit at a desk all day, go sweat it out for an hour or so, and then go back to sedentary evening of Netflix or reading. My poor whiplashed body! Sound familiar? But with Parisian gym membership pricing through the roof (and who wants to go to Paris to be in a gym?! ), I had to find something different. Naturally, everyone's first thought is running. Everyone runs. It's free, and good for you. And I absolutely hate it more than anything else in this world. And now that I've said that some of you are checking out, like, wow this girl has no idea what she's talking about. If she doesn't run.... And I have found this to be a widely held attitude of runners, that if someone doesn't run they aren't trying hard enough, or they aren't ever going to really achieve their fitness goals. Thank God for Mireille, who encouraged me that the only way I could commit to getting my heart rate up was if my heart was in it. And my heart will never be in running. So shedding that guilt blanket, I started seeking out what I truly loved. I loved dancing. I loved riding my bicycle. I loved walking in Paris. And I wanted to learn to love Yoga. Now while the first two were dependent on weather and schedules (you better believe I am going to write a post on the Salsa clubs of Paris! ), the last two were definitely elements I could add into my daily routine. Secondly, I committed to 30 days of Yoga with Adriene, a online video series that uses a month of yoga discipline to develop one's home practice. Adriene was a perfect intro instructor for me with her California-cool attitude. She was great at easing into the daily challenges, always changing it up, and making you really appreciate those precious moments of focusing in on yourself and the needs of your body. I'm not all kookoo weird about this stuff, but it turned out to be an incredible stress relief, and started making me more aware of my posture and breath, as well as slowly developing my balance and strength. Again, not burning myself out, but slowly building my habits incrementally. And I think it's just that which is the secret to the thin Frenchwomen phenomenon. They have learned their bodies well, and make gentle, consistent adjustments that set them up for a lifetime of benefits. It's not some giant overhaul. It's self-learning and self-love. But these last 30 days of journaling and moving and tasting and discovering have made me begin to wonder what the next 30 days have in store. What more I have to learn of food and movement and myself with the two. Incidentally, I lost all the weight I gained since moving to France just in January, just by beginning a mindful approach to how I feed and move my body. Sans the calorie counting and gym membership. And I didn't even notice anymore. Maybe that's where the real French osmosis happens. Because you don't move to Paris to lose weight. You move to Paris to discover yourself. I'm learning to be bien dans ma peau. Now if you'll excuse me, today is my last of my 30 day yoga challenge, and I'm off to buy a new yoga mat to celebrate! Namaste.